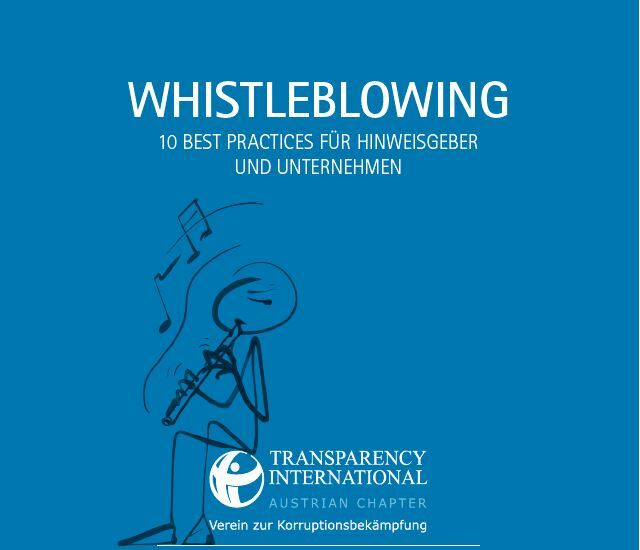 KNOETZL partner, Bettina Knoetzl, President of Transparency International, Austrian Chapter, the local division of Transparency International, suggests checking out the organization’s new guidelines for whistleblowers. As stated in the introduction of the guide, fighting corruption often requires courageous individuals – so called “whistleblowers” – to step forward to report fraud and thereby largely contribute to fighting legal violations. Consequently, companies that offer well-functioning, internal reporting systems for such violations can limit or even stop potential losses to their business and reputation. The best practices set forth by Transparency International are designed to help companies and the whistleblowers on how to deal with sensitive situations that in implicate fraud or corruption. Be loyal: respect the corporate culture of your company including its values. Be brave: report misconduct by communicating who, what, when, where, how and why. Be detailed: whistleblowers should offer supporting evidence for the perceived misconduct on which they are reporting. Follow the rules: if your company offers specific guidelines on how to communicate fraudulent behavior, it is best to follow those rules. Make decisions: whistleblowers need to decide whether they want to remain anonymous. However, the chances of stopping the misconduct are much higher if investigators can ask follow-up questions. Be careful: protection of whistleblowers has its limits. Carefully consider who you want to confide in. Be informed: find out as much as possible about the legal consequences of your actions as a whistleblower. Be in the know: learn about any internal reporting systems – hotlines, compliance departments, ombudsman-officers – and external reporting systems – authorities, Financial Market Authority, public prosecutors, etc. Be truthful: to remain credible, stick with the facts and don’t exaggerate. Keep records: take notes and document what you know and which whistleblowing actions you have taken. Don’t look away and don’t rely on others speaking up! Don’t forget about your own moral standards! Integrity starts with the individual. Don’t play detective! You may tip-off the person committing fraud who may in turn destroy evidence. Don’t give up! If the company will not follow the leads you provided, contact external authorities. Don’t rely on remaining anonymous! The procedure of uncovering fraud may require that the name of the whistleblower is released. Don’t underestimate the risks! Reporting potential corruption may lead to professional and personal consequences. Don’t ignore that there might be potential sanctions by your employer. Don’t confide in third parties (family members, friends, etc) and avoid other leaks. Also watch out for confidentiality agreements within the company. Be an advocate: whistleblowers are more likely to step forward if they know the company will stand behind them. Show integrity: take all reports of potential fraud and corruption seriously. Be transparent: offer workshops about the company’s code of conduct and on the whistleblowing procedure. Communicate: let your employees know how they can report misconduct. Protect: assure the protection of the whistleblower’s anonymity within the company. Contemplate risks: each implication of misconduct may have consequences for the company. Be aware of the breath of those potential consequences. Know your rights: consider Austrian as well as European law. Offer communication tools: gain your team’s trust and loyalty by offering simple and discreet ways of reporting misconduct. Inform: let your employees know that whistleblowers will be treated with respect. Keep records: detailed documentation will help make fact-based decisions and avoid misunderstandings. Don’t spread rumors: be sure you have all the evidence before making any claims. False and imprecise statements may have legal consequences. Don’t forget about your digital fingerprint! Your IT department stores all emails. Be sure to keep your notes in a safe place instead. Don’t disregard your responsibility! Any reports of misconduct don’t just affect the people involved, but the entire company. Don’t let your personal opinions interfere with the situation at hand. If you have a conflict of interest you may want to transfer your responsibilities to someone else. Don’t harm the company’s reputation by leaking information. Any communication to the outside may hurt your company. Don’t feed rumors: communicate results and measures but remain discreet. Don’t demonize whistleblowers: don’t put pressure on those who report misconduct to reveal their identity. Don’t underestimate the risks: ignoring reports may lead you to lose control over the situation. Don’t just react: be proactive in offering protection for whistleblowers; get expert legal advice. Don’t minimize your role in the process! The better the internal reporting system is set up, the more likely whistleblowers will step forward. Don’t question credibility: create awareness that whistleblowers will not be vilified. Don’t break trust: respect confidentiality with regards to recordkeeping and data protection; however, authorities may require all details of the situation and the people involved. For more details, you can read the complete guideline in German or contact Partner Bettina Knoetzl or your customary KNOETZL professional.